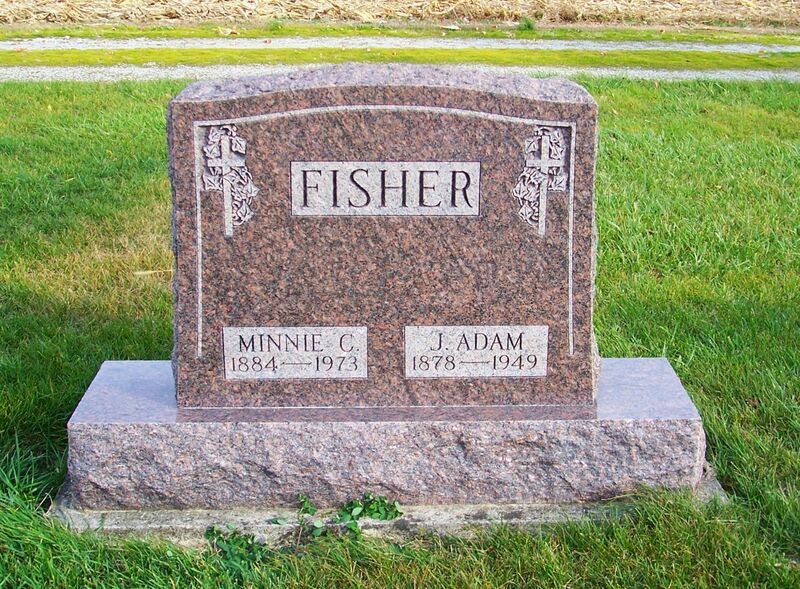 Adam John Fisher was born in Mercer County, Ohio, on 5 April 1878 to John Christain and Mary Ann (Bollenbacher) Fisher. He usually went by the name of Adam or A.J. Adam Fisher married Minnie Christina Koch on 5 May 1904 in Wapakoneta, Auglaize County, Ohio, married by Rev. E.J.E. Kuhlmann. Adam was 26 and Minnie was 19 years of age. Their daughter Koneta married Milbert Stroh in June of 1925 and the newlyweds apparently went to live with her parents right after their marriage. It appears that they lived with them until her parents passed away. 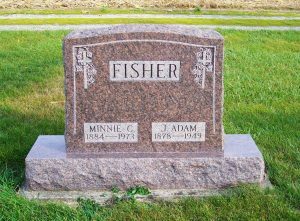 Adam John Fisher died of cerebral apoplexy/hemorrhage at his home in rural Liberty Township on 22 February 1949 at the age of 70 years, 10 months, and 17 days. He had had the medical problem for 13 months. He was a farmer and had not served in the armed forces. Walter C. Brookhart was in charge of the funeral arrangements. Adam’s wife Minnie was the informant for the information on his death certificate. According to Zion Chatt’s records Adam was survived by his wife Minnie, daughter Koneta, son-in-law Milbert Stroh, foster granddaughter Sandra Jayne, a brother William Fisher, and sisters Mrs. Elizabeth Koch, Mrs. Louise Strabel, and Mrs. Emma Werts. He was buried on the 24th and Zion’s Rev. Waldo Byers was in charge of the service. Minnie (Koch) Fisher died in Mercer County, Ohio, on 1 May 1973. According to Zion Chatt’s records she died of complications. She was survived by her daughter, a brother, a grandchild, 2 great-grandchildren, and 3 step-great-grandchildren. She was buried on the 4th and Zion’s Rev. Ralph Hershberger conducted the service. 1880 U.S. Census, Liberty, Mercer, Ohio, ED 188, p.474C, dwelling 53, family 56, John C Fisher; Ancestry.com; NARA microfilm T9, roll 1048. 1900 U.S. Census, Liberty, Mercer, Ohio, ED 85, p.6, dwelling 117, family 122, John Fisher; Ancestry.com; NARA microfilm T623. “Ohio Marriages, 1800-1958,” database, FamilySearch.org, A.J. Fisher & Minnie Koch, 5 May 1904; Auglaize Marriages, Vol. 9, p.228; FHL microfilm 963059. “Ohio, County Births, 1841-2003,” database with images, FamilySearch.org, Minnie Koch, 24 Dec 1884; Duchouquet Township, Auglaize County Births, Vol. 2, p.238, no. 24; FHL microfilm 959200. 1900 U.S. Census, Duchouquet, Auglaize, Ohio, ED 31, p.12, dwelling 216, family 217, Crist P Koch; Ancestry.com; NARA microfilm T623. 1910 U.S. Census, Liberty, Mercer County, Ohio, ED 119, p.11A, dwelling 197, family 202, Adam Fisher; Ancestry.com; FHL microfilm 1375227, NARA microfilm T624, roll 1214. 1920 U.S. Census, Liberty, Mercer, Ohio, ED 140, p.10B, dwelling 198, family 215, Adam J. Fisher; Ancestry.com; NARA microfilm T625, roll 1418. 1930 U.S. Census, Liberty, Mercer, Ohio, ED 20, p.2A, dwelling & family 38, Adam Fisher: Ancestry.com; NARA microfilm T626. 1940 U.S. Census, Liberty, Mercer, Ohio, ED 54-22, p.7B, household 145, Milbert Strok [corrected as Stroh]; Ancestry.com; NARA microfilm T627, roll 3114. “Ohio Deaths, 1908-1953,” database with images, FamilySearch.org, Adam John Fisher, 22 Feb 1949; no. 11028; FHL microfilm 2246585.